Lockheed Martin F-35 lightening II is a single-seat, single-engine fifth generation fighting aircraft with proposed stealth capabilities. 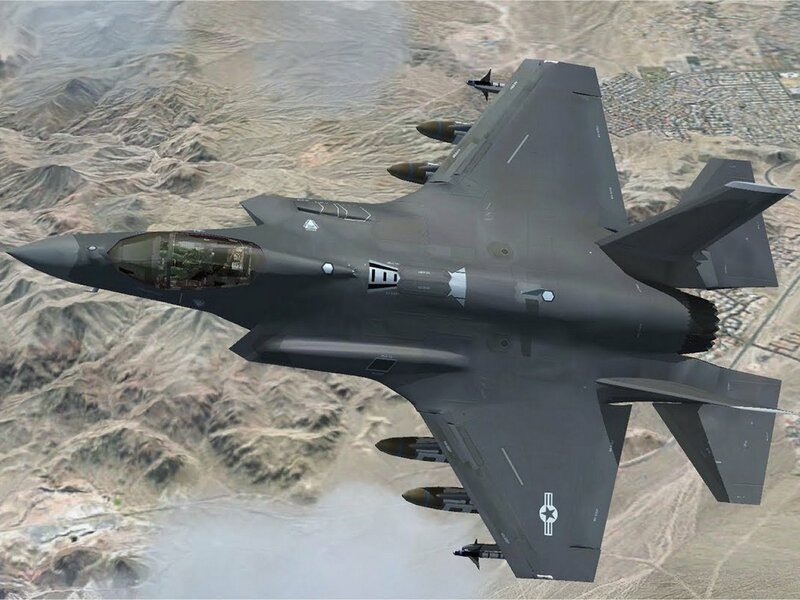 It is a tri variant project, producing F-35A (conventional landing and takeoff), F-35B (short takeoff and vertical landing) and F-35C (Navy variant), developed by Lockheed Martin Corporation, United States of America. USA plans to buy 2,443 of these aircrafts. The engine used on the F-35 is the Pratt & Whitney F135. An alternative engine, the General Electric/Rolls-Royce F136, was under development until December 2011 when the manufacturers canceled the project. Neither the F135 nor F136 engines are designed to super cruise in the F-35, however the F-35 can achieve a limited super cruise of Mach 1.2 for 150 miles. It is one of the biggest defense projects with huge monetary commitments attached to it. Economic footprints of several other countries including many NATO members (Turkey, Netherlands, Denmark, Britain, Canada, Italy, and Norway) and other Americas allies (Australia, Japan, Israel, and Singapore) could be seen in it. JSF is also running in a bid against Boeing’s Silent Eagle F-15 in South Korea to replace its obsolete fleet of F-5 and F-6 .The programme aims to evolve as a multi role flying aircraft similar to F-22, with air to surface and air to air capabilities. It incorporates integrated sensors to provide capabilities such as Intelligence, Surveillance and Reconnaissance (ISR), advanced electronic warfare, and command and control. JSF programme can be seen as an ambitious programme which tries to imbibe all the modern technological advancements in a single jet fighter to produce one of the world’s most advanced tactical fighters or so does the manifesto say!!!!!! The programme started back in 1990’s when US government realized that the Soviet Union has developed advanced radars and sensor systems to make their F-15 and F-16 fleet obsolete in foreign land. Lockheed Martin developed a prototype X-35 which eventually won the bid for the Joint Strike Force programme. Many civilian experts in the defense industry who have closely analyzed the programme shape, called it a “paper plane” with billions of dollars hung to its neck. And the current situation tells no other story. The programme had to undergo a line of delays and cost inflation as much as 70% from the original proposed estimations. Programme has always lacked precise approximations in cost as well as deliverance. Due to its low maneuverability and limitations in its agility it’s often called “the flying camel”, a failure just waiting to happen. Lockheed has surprisingly committed one of the most common mistakes of aerospace industry “concurrency”. It is basically opting for mass production way before completing its testing, design performance analysis and design data correction phase. Like every aerospace programme it had to undergo a number of design iterations and being a defense project of this magnitude it has encountered problems which are entirely alien for the industry. Lately, one of the issues faced by the project was tail coating erosion which occurred in the corner of supersonic envelope. It has to keep a fly away distance of 25 miles from thunder and lightning, which itself is an irony to its name. The software development phase is way behind the hardware; it uses so much active digital computing that it risks for so many single point failures which leads to shear crashes. There have been incidences of software malfunction and at times crashes in the initial design phase. Its software is riddled with bugs which have been resolved yet. Another bump to it is that it is considerably heavier than the light weight fighters it is trying to replace (F-15,F-16,F-15). Adding to its misery are the death cycle that are being predicted by defense experts due to delays, as its purchaser are becoming cold feet and may revoke the contract, thus coast of the fighter will escalate. Currently to comply with the across the board budget cuts mandated by congress Pentagon is considering delaying its controversial F-35 programme. The U.S Air Force procurement office has established an F35A initial operating capabilities target date of December 2016. Norway, Belgium (and Canada, Israel, Singapore): level 3, at l-2%, or c 0.22- 0.44 billion each, with no influence on decision or access to sub-contracts, receiving only some information. At the rate of decline of United States air combat power, and the rise of foreign air combat capability, there are but a few years before ‘mismatch’ becomes ‘overmatch’ – at the expense of the United States and its Allies. Posted on August 1, 2013, in Army, Aviation. Bookmark the permalink. Leave a comment.